As I’ve said before, one of my favourite things is being able to meet up with friends while abroad. A few weeks ago I was randomly in Bratislava, the capital of Slovakia, of all places, at the same time as my friend Dasha, so I thought it would be the perfect time to publish her interview. Unfortunately I had some laptop troubles, and am only getting to publish now! She has had so many cool travel experiences, and she has agreed to tell us about one of them – that time she took a (small) BOAT across the Atlantic Ocean instead of the usual – a flight! So here is the story of that adventure, and if we’re lucky, it won’t be the last time we get to hear one of her awesome stories on this blog. Dasha Kostenko, is 28 years old, and was born and grew up in Latvia. She traveled around Europe a little bit after finishing high school, then moved to Australia, where she lived for nearly three years. 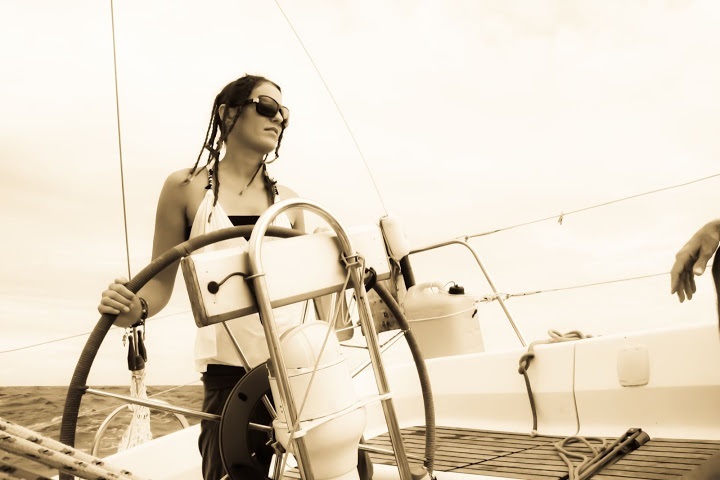 After saving enough money she travelled around the globe for a year starting in China, taking the Trans-Siberian to Europe and then conquering the Atlantic Ocean on a sailboat. She is now happily living in Latvia and is getting ready to move to London to save up in order to continue her travelling adventures. What was your plan for the year of travel that included the Atlantic trip? The initial idea was mostly to explore South America. We were leaving from Australia and I hadn’t been back home for a while, so we decided to go through Europe. Since we are both environmentally conscious people, we decided to try to travel as green as possible, which meant flying as little as possible, however we weren’t too extreme as the main purpose was to enjoy ourselves. We began in Asia and took the Trans-Siberian across Russia into Europe. After spending the summer around Europe I went to Norway to volunteer for an amazing project called, Sailing the Farm- Sea Gypsies, which is basically helping a legendary man build a sail boat on his farm. I highly recommend volunteering at his amazing farm. After hearing all the stories of sailing the seas I was really excited to attempt it myself. What made you decide to take a boat across the Atlantic instead of taking a flight like everyone else? As I already mentioned, we are environmentally friendly folks and try to fly as little as we can. We were always considering crossing the Atlantic by boat. The first option was to take a cargo boat, which ended up being quite expensive and would ultimately not be very much fun. After volunteering at the farm in Norway, I learned that hundreds of boats leaving from the Canary Islands every year for the Trans-Atlantic race, ARC. This is an excellent opportunity to hitchhike across the ocean, as many boats are looking for a helping hand as watch crew, kitchen hands or even a babysitter. Did you have any fears or apprehensions about the idea? Funnily enough, I don’t recall having any fears or anxiety about it, even though I was going to be spending so time at sea without any experience in sailing. I was more just excited and keen to learn all the sailing tricks. How does one go about obtaining such transport? We went to the Las Palmas on the Canary Islands, as that’s where the race starts from. 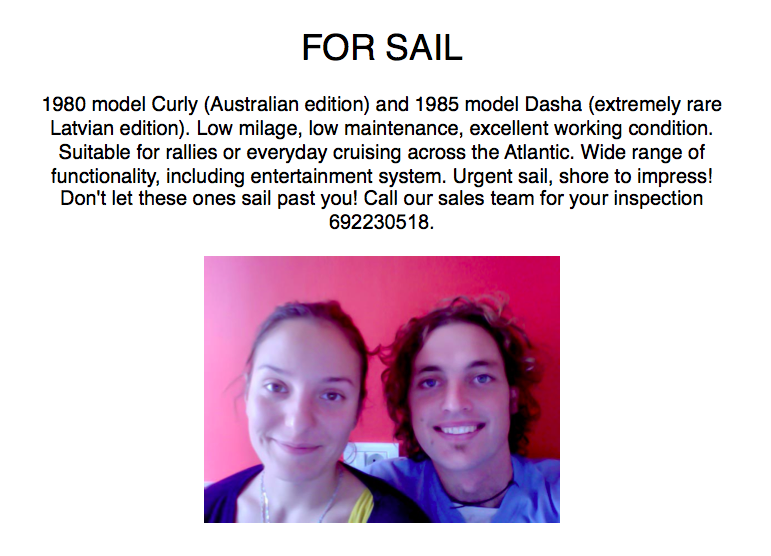 After researching about hitchhiking opportunities on Couchsurfing and speaking to people at hostels, we heard that the best way to find a sailing ride was to head to the sailor bar at the marina and post an ad about ourselves with all the details about how amazingly helpful and necessary we could be on board. When we found the information board in the famous Sailor’s Bar, it didn’t have any free space for our ad to be pinned to. We hadn’t realised how much competition there was for a free spot to cross the Atlantic. We ended up spending three weeks on the island waiting, looking, asking around, when we finally found an English captain who was in search of five people to be his crew. 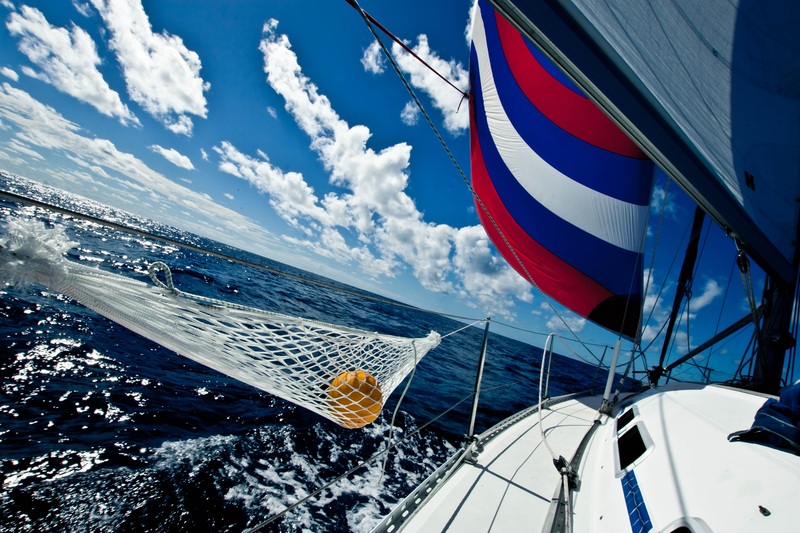 Did you have any prior boating or sailing experience? What did you have to do to prepare for the trip? 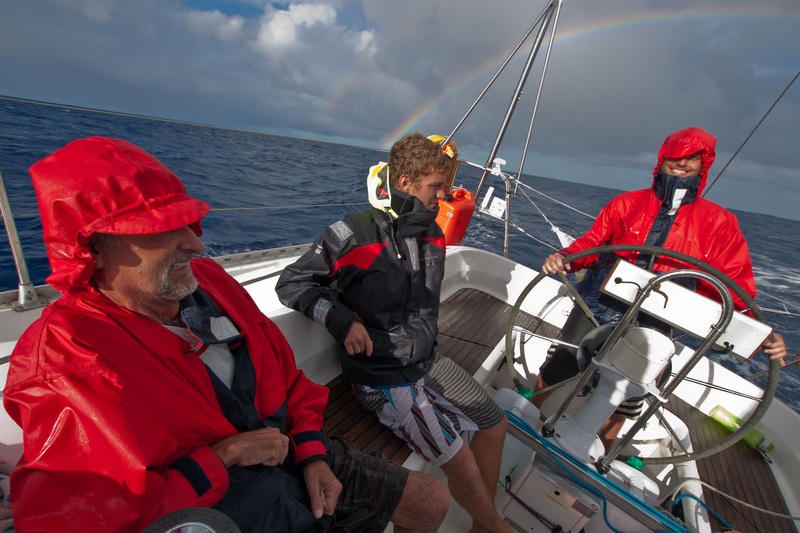 We had a few chats with our captain, then went out for a trial sail for a couple of hours. After that, we set a date to leave the Canaries and began to plan our trip. The captain of the ship has crossed the Atlantic some time ago and had a good idea of what was needed. We helped to plan the food and water provisions. In the end we had to convince our captain that we really needed the amount of food and water that we intended to take, since he was trying to keep his boat as light as possible! Our boat was a beautiful 34-foot Gib’Sea. Our crew consisted of six people, three of whom had prior experience and the other three were complete newbies. 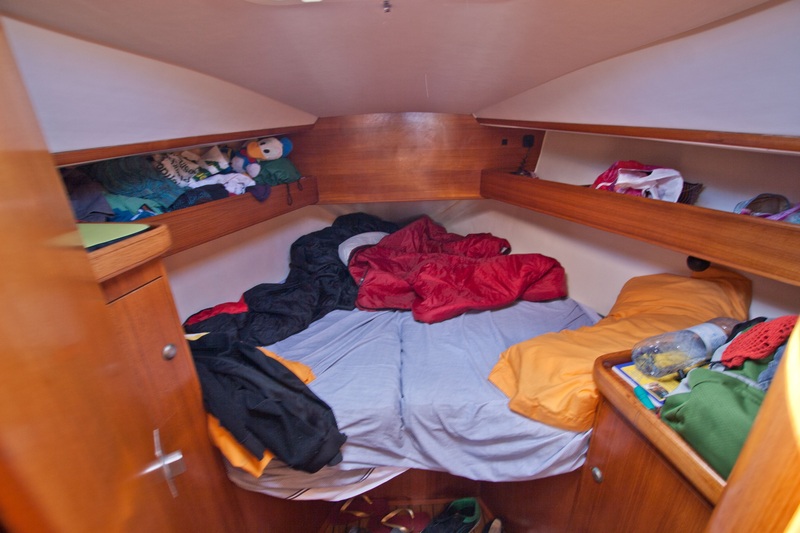 We had three cabins and an extra sleeping place in the lounge, for those who didn’t want to get cuddly with their sailing companion. As fresh water was limited, there were no showers for the whole trip. What saved us was a bucket and special soap for saltwater. I recommend to braid or dread your hair as it gets incredibly tangled and fragile in saltwater. How many other people did you share this journey with and who were they? What were the different roles and how were the various tasks distributed? Our crew was five plus a captain. All five of us met at the hostel while looking for a boat to cross the Atlantic. Most of us were around 30 years old, adventurous and happy people. One of the crew, Roger didn’t even plan to cross the Atlantic until he met us at the hostel, found out about the idea and ended up literally jumping on board. You can’t have a boat without a Jolly Roger! We all shared the same responsibilities. We would take a watch in pairs, eight hours in a day split in two parts. So normally four hours in the morning and four in the evening. We took turns cooking and washing up as well. How long did the journey take? Was this shorter or longer than expected? Where did the journey end? The journey took us 26 days, which was longer than we had expected as we were hoping to make it in 20 days. We ended in Antigua, in the Caribbean. 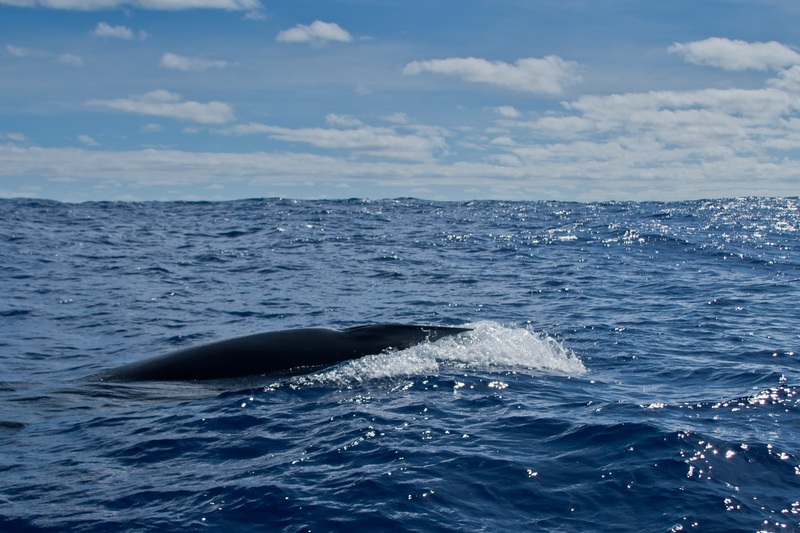 Describe a typical day making your way across the Atlantic Ocean. A typical day would involve getting up really early in the morning or even night, putting on your wind jacket, quickly making a cuppa and up on a watch you’d go. Headphones in the ears or a nice chat with your watch mate for four hours, breakfast or a snack in between. Then it’s either breakfast or lunch, eight hours of rest – which would be reading a book, playing dominoes, sleeping, editing pictures, chatting, sunbathing, educating oneself on sailing, and so on. There was surprisingly never a time when I didn’t know what to do with my free time. Then it was another four hours on a watch shift and to bed for a healthy eight-hour sleep. What were some of the challenges that you faced along the journey? I think the only big challenge came after we had spent two weeks at sea and suddenly there was no wind for almost four days. The most frustrating thing was not knowing how long it would last, and we couldn’t use the engine to move forward, as we were conserving petrol. We also began to worry about our food and especially fresh water supplies – would it be enough? How long there will be stuck out here? What if it’s another week? We were just drifting in amazingly calm water, that reflected the peaceful clouds above us. What were some of your favourite memories from the journey? I have plenty of favourite memories and happy times. Getting to know my sailing mates, cooking and eating together, observing the beauty of the open ocean, dolphins putting up a trick show almost every night, seeing whales one meter away from boat, swimming in the middle of the ocean, catching and cooking fresh fish, smelling the earth before we weren’t able to see it again for 26 days! Can you describe what it is like to be in the middle of the ocean? It is thrilling! I had an overwhelming sense of freedom and acknowledgment that everything in this world is really possible, you just have to make that first little step. And never forget to be amazed! What was the first thing you did when you reached dry land? We got into a dingy and paddled to the first bar. Stumbling on our sea legs was pretty funny. Getting our first cold beer was brilliant. Reggae music, birds, flowers, trees, COLD drinks from the fridge – all the little things one doesn’t appreciate when they have them everyday. Would you do this type of trip again? If so, what would you do differently? Yes, for sure! Maybe I would try a bit earlier on the internet, to find a yacht. I would also probably do some research on the cheapest accommodation options, such as camping or Couchsurfing in the Canary Islands, since we didn’t know that it would take so long to find a yacht. Would you recommend this type of adventure to others? If so, what types of people would be best for the challenge? I would definitely recommend doing it – it will change your life! The best people would be those who are not scared of adventure and being on the ocean for a month. Obviously there is no escape once you’re on the yacht. Easy going and flexible people who get along with others easily. It’s definitely not for those who need their solitude or who need things to be done their own way. What advice would you give to others wishing to partake in a similar adventure? Have a good look at the people you will be crossing with. You want to make sure you like people you are going to be stuck on board for almost a month. What is your best general travel advice? Don’t be scared. The less you have the more freedom you’ve got. Follow your heart, don’t plan and see where your intuition, luck and the wind will take you. Always remember that you are there to learn something. Thanks so much to Dasha for sharing her awesome adventures with us. Read more about her journey at Flip Flop the World. Hope to see you in London soon!